How Much Does a Chicagoland Pool Deck Cost? We often think of summer as a time to get away and vacation on a beach in a relaxing spot of the world. But have you considered making your backyard a relaxing summer destination? When you add a pool to your backyard you have the opportunity to create your very own summer retreat by incorporating your favorite outdoor living elements. Whether you’re an adult, a child, or simply a child at heart, there is nothing better than cool water on a hot summer day. 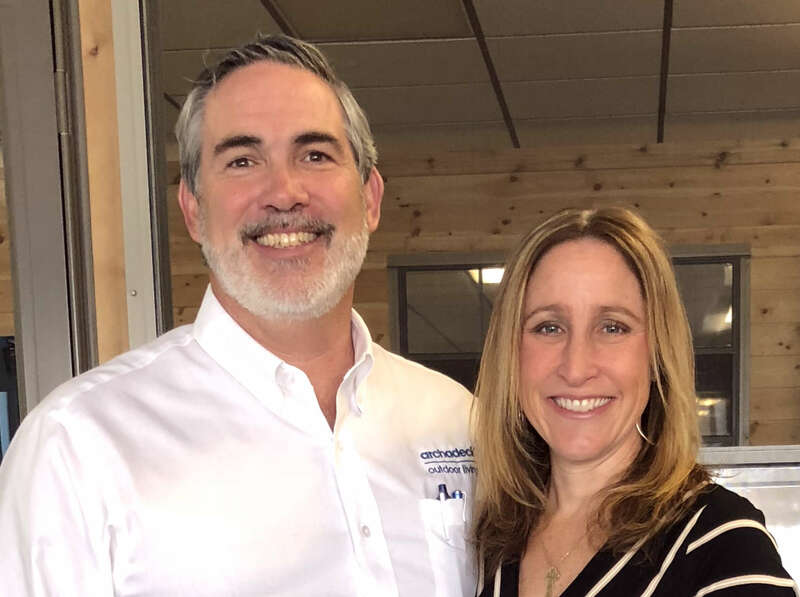 With the help of an Archadeck Design Consultant, you can design a space that incorporates your pool, compliments your home, and transforms your yard. As you begin looking at the many pool options available to you, consider the differences between above ground and in-ground pools and how those differences can affect the cost and design of your pool deck. Before purchasing my own pool, I did plenty of research and learned that investing in an above-ground pool with a deck was comparable to installing an in-ground pool with a patio. Of course, these numbers will depend on materials, size, and location, so please take care to do your research. Before you take the plunge and purchase your pool, here are a few things to consider that will help you make a decision that matches your family’s lifestyle and budget. 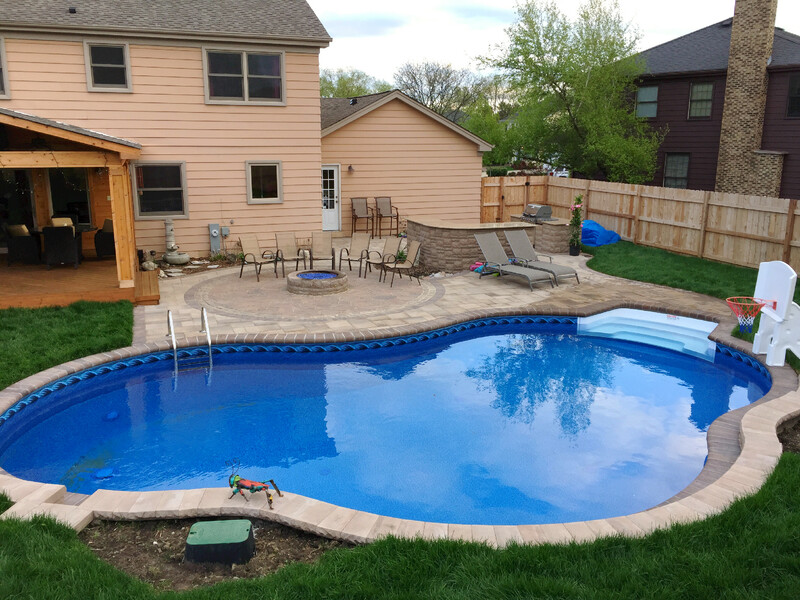 Above-ground pools are often associated with a lower price tag and easier installation, making this an attractive option for many homeowners wanting to add a pool to their backyard. In contrast, above-ground pool decks tend to be expensive and can easily cost more than the pool itself. As with any deck, the under structure must include perimeter footings and deck supports to ensure a safe, long lasting structure. A square or rectangular deck requires fewer supports. A rounded deck (as one would find wrapping around a pool) requires several, raising the price considerably. To avoid such an increase, we often recommend building the deck along one side of the pool. This gives you more deck space for your money and gives the swimmers space to sit, sunbathe, or dine near the water. Wrapping the deck around the pool often leaves you with little functional space as most of the deck space is more of a walkway around the pool. This walkway, however, makes cleaning the pool easier than if you’re standing on the ground. Depending on your personal preferences, you may decide wrapping the pool and creating such a walkway is well worth the investment. Another consideration to keep in mind is how the pool and deck will look aesthetically in your yard. Will they stand alone away from the house or will the pool be installed near the home so you can step right outside onto your pool deck? Either way, it is important to consider how the pool and deck will look as you relax in your backyard. While you are adding a pool for the benefit of enjoying the water on a hot summer day, much of your time will be spent looking at the pool from your yard or home. A good pool and deck design will compliment your backyard, successfully turning your backyard into your very own summer retreat. In-ground pools can add value to your home and are known for their beauty, enhancing your landscape as a water feature and creating an attractive view from inside your home or outside in your backyard. Patio pool decks are a popular option as they are easy to maintain and seamlessly blend the outdoor living spaces while beautifully complementing your home and backyard. 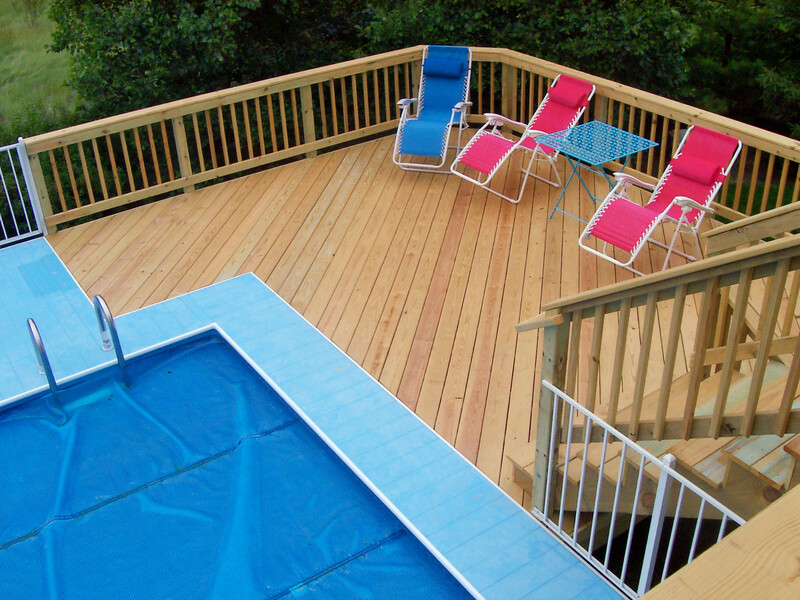 With no need for the structural elements you find with decking, a patio pool deck becomes a budget friendly option. At Archadeck of Chicagoland, we recommend installing pavers instead of concrete as pavers are easier to maintain and repair whereas concrete will crack over time. Pavers also allow for easier access to any piping that runs beneath. Simply lift the pavers and relay them when finished (though we do recommend speaking with a professional first). The pool deck design process can vary depending on the type of pool you are installing, the materials you’re using, the location of the pool, and how you want the design to affect your current landscaping. Consider how you want to use your pool and how much space you will need. Perhaps you only want a couple of lounge chairs and place to hold your towels or maybe you would like a space large enough for dining and entertaining. It is helpful to have an idea as to how you are going to use the space before you begin making any decisions. If you are purchasing an above-ground pool, it’s usually best to have it installed before we get too deep into the design process. Although if you have the measurements and exact location it is possible to discuss design plans before it’s installed. There is a little more flexibility with patio pool decks. It would be beneficial to work with both your pool and patio companies to create a design that compliments both features, incorporating the aspects you want for the outdoor space. This includes determining any additional amenities that may be added, such as a built-in fire pit, an outdoor kitchen or a grill surround. Alternatively, you may also install your patio first, keeping in mind that your pool will be added at a later date. Once the pool is installed, pavers can be added to fill the space between the pool and patio to complete the design. If you are considering adding a pool deck or other outdoor living space, we would love to hear from you! 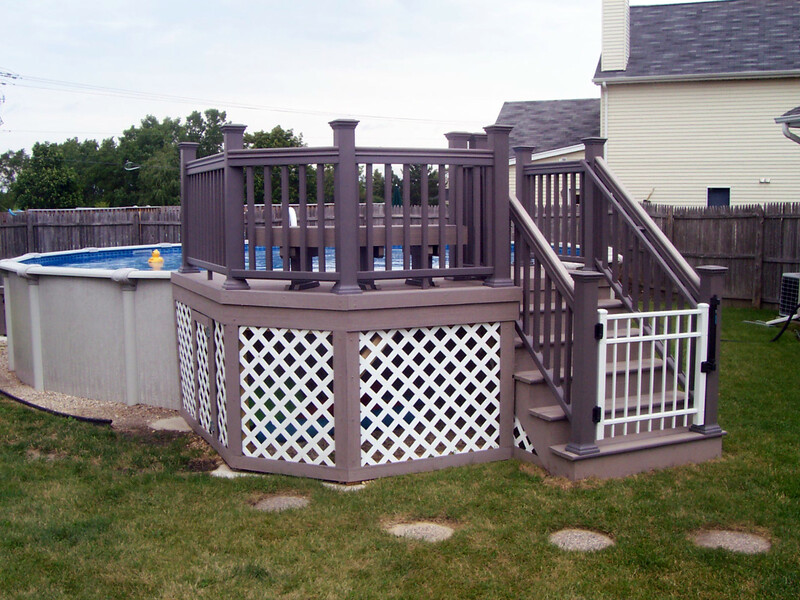 You can sign up for a Free Archadeck Design Consultation or give us a call at (847) 496-4333. Our experienced Design Consultants are happy to help you turn your backyard into the ultimate summer destination spot.